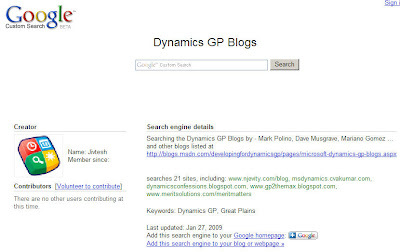 To help myself, and other people like me I have setup a Custom Search Engine which searches all Dynamics GP Blogs. I took the list (about 20 Blogs) compiled by Dave. Thank you for including our Rose Business Solutions GP blog in your search tool. Great idea. Thank you for creating the custom search engine. This will save lot of time. Otherwise we have to search each blog to find required posts. One place to search all blogs is huge help. Thanks for including DynamicAccounting.net! I'm looking forward to some more original stuff from you as well! Much thanks for including me in this list!